PCL, printer command language, is a de facto standard issued by Hewlett-Packard for printers. Files stored in PCL format are not friendly for sharing and publishing, so they have to be converted from pcl to other commonly used formats. PS, PostScript format, is a file format that contains all controlling codes for displaying the elements of graphics, texts in one single file, which is popular accepted in publishing. VeryPDF PCL Converter is designed for converting pcl files to other frequently used formats, such as pcl to ps, pcl to pdf, pcl to jpg, etc. VeryPDF PCL Converter has two versions, of which one is of GUI and the other is based on command line. This article is to introduce the usages of converting pcl to ps using PCL Converter. Before using the program, you have to download VeryPDF PCL Converter at http://www.verypdf.com/pcltools/index.html#dl and install it into your Microsoft Windows Operating System. You can launch the program after installation, using the following two methods. The first one is the menu path, [start] –> [All Programs] –> [VeryPDF PCL Converter 2.0] –> [VeryPDF PCL Converter 2.0]. The other method is directly double-clicking the icon of program “winpcl.exe” in the installation directory of PCL Converter. Before registering this program, you can press the “try” button to dismiss the dialog of registration on its startup. The main window of PCL Converter is presented in the following screen snapshot. The following words are for describing the usage of converting pcl to ps format using PCL Converter. Before the conversion, the first step is adding the files of pcl to the file list in the main window of PCL Converter. There are four ways to pulling the files into the file list. Follow the menu path, [File] –> [Add Files], choose the files in the dialog of Windows file picker. Follow the menu path, [File] –> [Add Directory], choose the directory where the files are stored in the dialog of “Browse for Fold”. Press “Add Files” button in the main window of VeryPDF PCL Converter, and choose the files in the popup dialog of Windows file picker. Drag those files from the Windows Explorer window and drop them into the main window of PCL Converter. The second step is for settings. The following two items are two different ways to activate the setting dialog. Follow the menu path, [File] –> [Settings]. 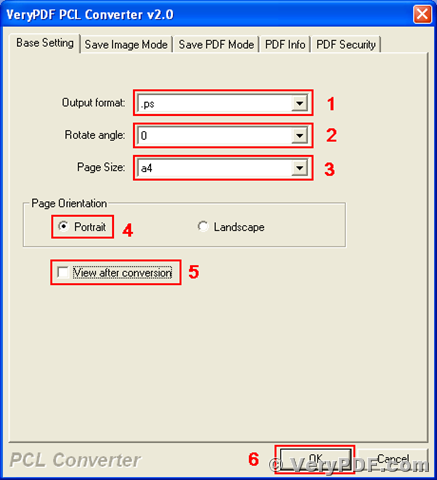 Press the button of “Setting” in the main window of VeryPDF PCL Converter. In tab of “Base Setting” of the setting window titled “VeryPDF PCL Converter 2.0” as presented in the next screen snapshot, select “.ps” in the dropdown list of “Output format”, choose “0” in the dropdown list of “Rotate angle”, select “A4” in the dropdown list of “Page Size”, check the radio button of “Portrait” in the group box of “Page Orientation”, uncheck the box of “View after conversion”, and press the button of “OK”. After finishing the setting, you will come to the main window of PCL Converter. The last, third step of converting pcl to ps using PCL Converter is pressing the button of “Start” in the main window of the program. Select a directory in the popup “Save As” dialog, and then the conversion from pcl to ps is completed. 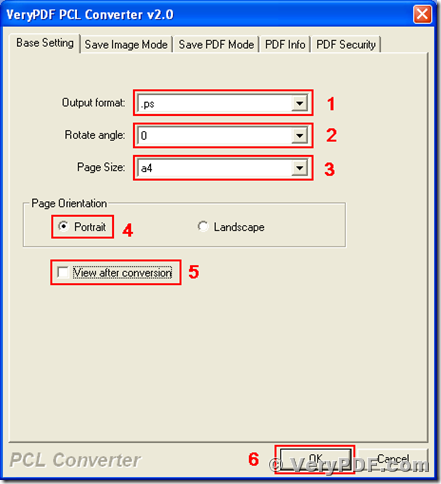 You can also use PCL Converter to convert pcl, pxl, px3, pm, to pdf, jpg, bmp, etc. There are some articles about this program here. You can buy a license for the program via URL http://www.verypdf.com/order_pcl2pdf_end.html. This entry was posted in Advanced PDF Tools, PCL Converter and tagged PCL Converter, pcl to jpg, PCL to PDF, pcl to postscript, pcl to ps. Bookmark the permalink.